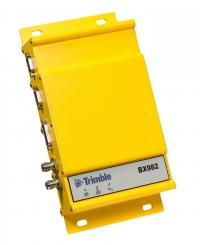 The Trimble BX982 is a multi-channel, multi-frequency GNSS receiver for marine applications that require centimeter-level accuracy and heading. It is well suited for marine construction contractors and marine system integrators. The dual antenna input gives the BX982 significant advantage over single antenna GNSS systems that have difficulty determining where the antenna is positioned relative to the vehicle and object of interest, especially when dynamics are low. External sensors can be used to augment a single input system, however these tend to drift when static. Heading derived from dual-antenna BX982 GNSS measurements overcomes these issues and is economically the right choice. The BX982 was designed for easy integration and dependability. It combines a single Trimble BD982 receiver module with a ruggedized, environmentally sealed enclosure that is very easy to install. The BX982 is rigorously tested to perform in harsh environmental conditions with the reliability you expect from Trimble. Customers also benefit from the Ethernet connectivity available on the board, allowing high-speed data transfer and configuration via standard web browsers. The BX982 supports Fault Detection and Exclusion (FDE) and Receiver Autonomous Integrity Monitoring (RAIM) for safety-critical applications.